Guest blogger Gail Sachson heads to the Amon Carter Museum of American Art in Fort Worth for a retrospective of the photographer’s work. 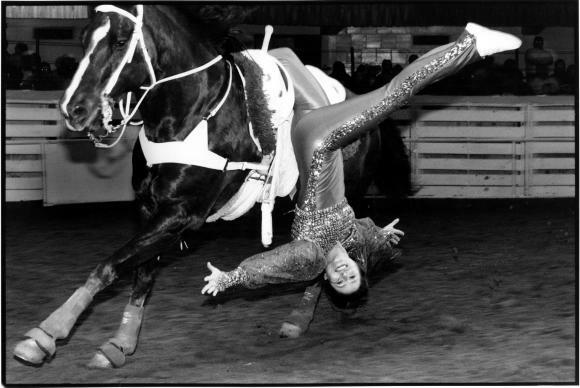 “Trick Rider, Fort Worth Stock Show and Rodeo, Fort Worth, Texas, February 1, 2001” Gelatin silver print photo by Laura Wilson. Guest blogger Gail Sachson owns Ask Me About Art, offering lectures, tours and program planning. A former Chair of the Dallas Cultural Affairs Commission, Sachson will present “50 Reasons to Love Dallas” through the SMU/CAPE program on Saturday, September 26. Listen to Laura Wilson’s conversation with Krys Boyd on Think. The American West was won through the determination, dedication, grit and guts of those who populated the area in the late 1800’s. 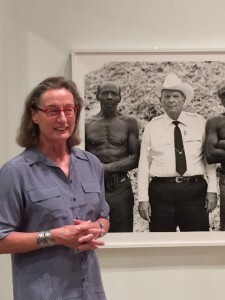 In “That Day: Laura Wilson,“ the photographic exhibition which recently opened at Ft. Worth’s Amon Carter Museum of American Art, renowned Dallas photographer Laura Wilson captures that same force and fearlessness in the faces and feisty demeanors of Westerners today. Whether photographing cockfights, communion, cowboys, sheriffs or stuntmen, Wilson’s photos, measured in feet rather than inches, command your attention, then empathy, then the burning need to know more about the people and places. The vast majority of the 71 photographs are gelatin silver prints , shot from 1979 to 2012 and printed in 2015 in sizes specific to the Carter installation. The majority are black and white. Wilson says she can’t say black and white is better than color, but she does suggest that she believes a spiritual component comes out more in black and white. Laura Wilson. Photo: Gail Sachson. The photographs are especially moving and magnetic because of their size and the fact that none are under glass. “We did that so you can see every detail clearly,” Wilson says. The clarity makes us feel as if we are there that day with Wilson as she sweet-talked two burly black men into removing their shirts for a shoot, when she visited with ornery artist Donald Judd ( she kinda’ liked his attitude), when she observed and exposed the abuses at Indian reservations and when she snapped mountain lion hunters on horseback. Growing up in a small town in New England, Wilson has always had a love of horses and a curiosity about the American West. She played Cowboys and Indians as a child, still rides horses ,and although she now travels the world on assignment from magazines and periodicals, such as The New Yorker, The New York Times Magazine and Vanity Fair, she still has a strong kinship with small towns. “She is drawn to people who by choice or circumstance don’t fit into either the suburban or urban mainstream,” Rohrbach says. She befriends diverse communities of ranchers, rodeo performers, lawmen, religious zealots, artists and animal abusers, all of whom have generously allowed Wilson to record their private lives. A glorious book, “That Day: Photographs in the American West,” complements the exhibition. The title emphasizes Wilson’s genuine engagement with the people she photographs. Instead of flipping pages as voyeurs and outsiders, looking at pictures OF the American West, we are invited IN the American West and into private lives. We are overjoyed that Wilson has taken us along for the ride. Her keen eyes and open heart have opened our eyes and hearts as well. The show closes Valentine’s Day, Feb. 14, 2016. The date is appropriate, for That Day:Laura Wilson is a love letter to the American West.